When you’re just starting out sewing, shopping for fabric can be a daunting task — especially when you’re going it alone without help from an experienced sewist. You don’t want to overbuy and you really don’t want to under buy, as the worst thing would be to start laying out your pattern pieces only to find that you don’t have enough fabric. Or possibly worse — that your fabric is the wrong type for your pattern. If you’re lucky, the person cutting your fabric at the fabric store can help with your purchase, but often they aren’t going to be very knowledgeable, especially at a chain store. It’s good to know exactly what you want when you start meandering around the bolts searching for the perfect fabric for your project. 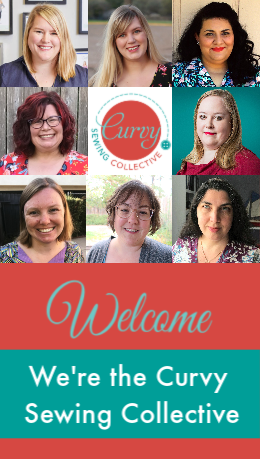 That way you’re all set when you arrive at the cutting counter and you can go back to your sewing room happy with your purchase. The first thing that you need to do is to study the pattern envelope for the garment that you want to make. The back of the pattern envelope always has a list of suggested fabrics. These fabrics are a guideline with fabric suggestions that will ensure that you use the right fabric for the pattern design. You are not just limited to these fabrics, but you should choose one with a similar weight and drape to the fabric suggestions. This particular pattern (Simplicity 1354) allows for a number of different types of fabrics. If you chose a pattern that suggested sturdier fabrics like poplin, sateen or faille — you would want to stay within that same range. Whereas if a fabric called for chiffon or georgette — you will want a sheer, lightweight fabric that drapes well. Patterns that call for knits definitely need to be made in knit fabrics as those garments are made to stretch and a woven will not work for that pattern type. Once you’ve decided on the types of fabrics that you want to buy, you need to figure out how much fabric to buy. 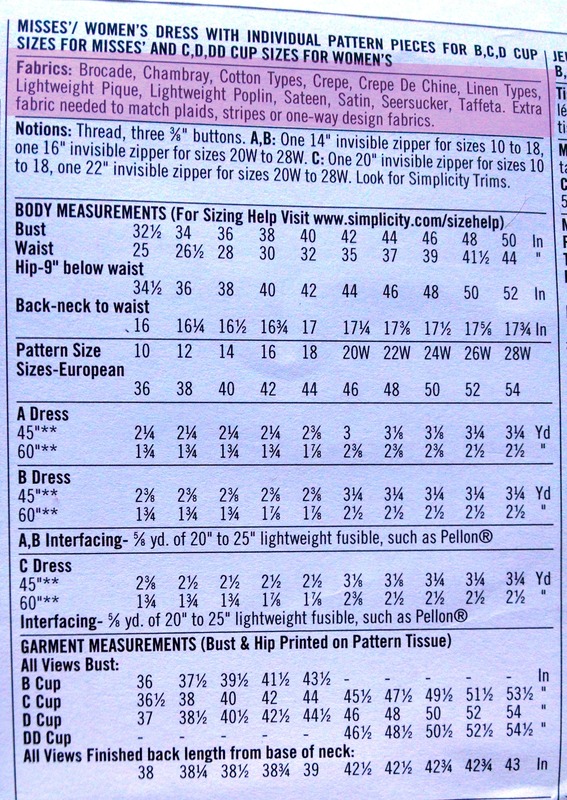 Looking closer at your pattern envelope, figure out your size (or sizes) based on your measurements and the pattern company’s size chart. Then follow the column down to the garment that you want to make (in this case, View A) and use that suggested amount of fabric as a guideline as to how many yards of fabric that you need. These amounts are always going to be more fabric than you’ll actually need when you cut out your pattern, but it’s best to follow along with this suggestion as it’s far better to have a little more fabric than a little less. 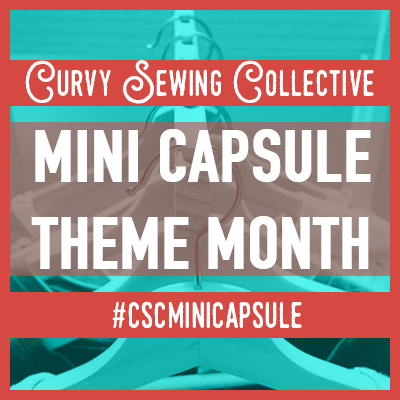 Most patterns will give you two widths of fabric to choose from — 45″ and 60″. Most of the time the fabric that you find will not be exactly these widths, so it’s good to have a fabric conversion chart. A lot of seamstresses carry these around in their purses when out fabric shopping and I believe that there are also some apps you can use on your phone that will make figuring out the length of fabric to buy easier. Once you’ve figured out what type of fabric to buy and how much to get, make sure you write it down so that you’re armed to hunt for fabric. I keep a list of fabrics and amounts on the Evernote app on my phone (Evernote also works with your tablet and computer) for various patterns that I want to make, that way when I am out fabric shopping, I will know exactly what I need to get. This is an example of a fabric bolt at Joann’s fabrics. Other chain fabric stores have similar ways to mark their fabrics whereas other smaller stores may have less information written on the bolts, but will generally include the fabric type, content and width. Often, I’m out shopping for fabric and see fabrics that aren’t on my list but is something that I want to use for another project. I’ll take into consideration the fabric type and content and get enough fabric to make something in particular. Generally, my rule of thumb for the garments that I make is: woven dresses 3.5-4 yards, knit dresses 2.5-3 yards, knit tops 1.5-2 yds, sweaters 2-2.5 yards, straight skirts 2 yards, fuller skirts 2.5-3 yards. If you don’t have a particular pattern in mind when you’re out shopping for fabric it’s a good idea to look at some different patterns for what type of garment that you want to make and jot down an estimate of what fabric that you need. It’s always better to buy more than less. Also, I’ll warn you that that type of fabric shopping will often lead to a growing fabric stash…. A lot of us don’t have fabric stores nearby that carry fabrics we’re looking for, so it’s great that we have so many sites to shop for fabric online. Generally, online fabric retailers will give you more information about a fabric than you can find whilst shopping in a brick and mortar fabric store. This image from Fabric.com tells you almost all you need to know about this fabric and what types of garments to use it for. 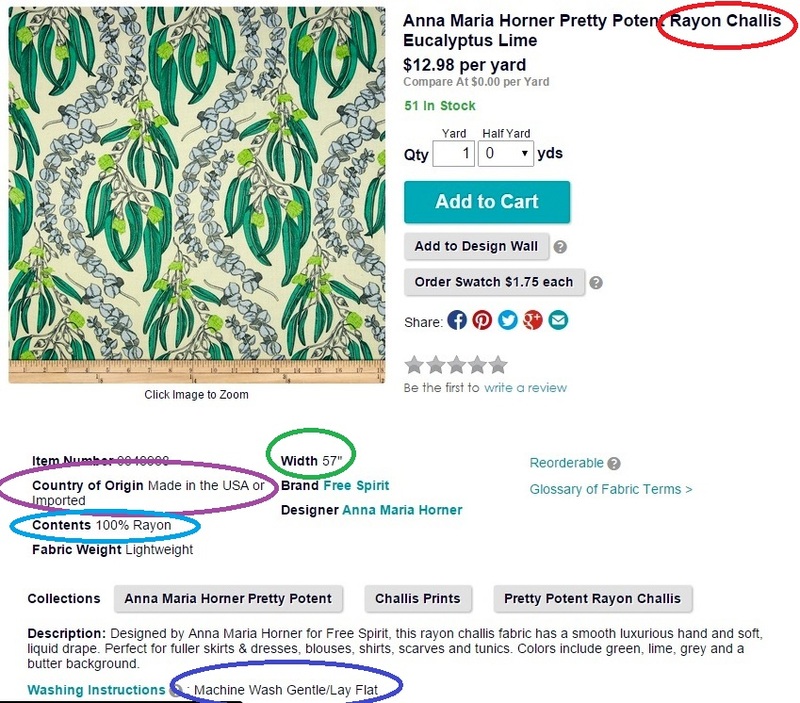 It doesn’t really give a country of origin, so if you’re searching for fabric produced in a certain country, this particular product description on this site does not tell you. Some people are wary about buying fabric online, but I buy most of my fabric online and I rarely have problems with what I’ve ordered. I’ve learned which fabric companies are better to buy from than others and if you’re concerned about a certain website, it’s best to check reviews or ask other sewists for recommendations before you buy. It’s also good to search for pattern reviews online to find out what types of fabrics other sewists have used to make up patterns that you’re considering. It helps to see patterns made up in different fabrics and how the pattern works (or doesn’t work) with the fabric. I hope this will help you find the perfect fabric (and enough of it!) to sew a great garment! Great article! I would add that to start, learn about different types of woven v. Non-woven fabrics, and before investing in enough for your pattern, buy some strips of 1/8 to test and wash. For example, I just bought a beautiful piece of boucle sweater fabric but it was 14 percent wool and thus,very itchy, plus shed like crazy, no good. No returns on cut fabrics! This is so helpful. 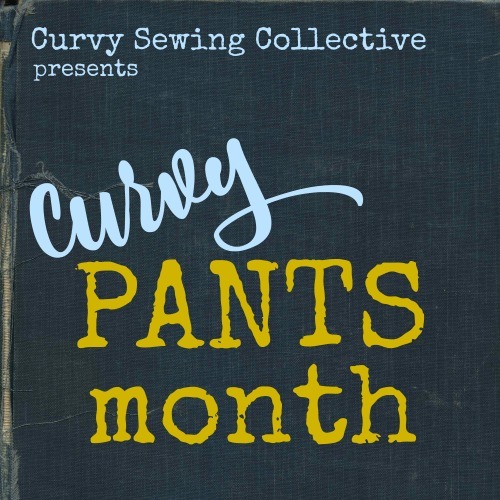 I have just retuned to sewing, so a great reminder, thank you! 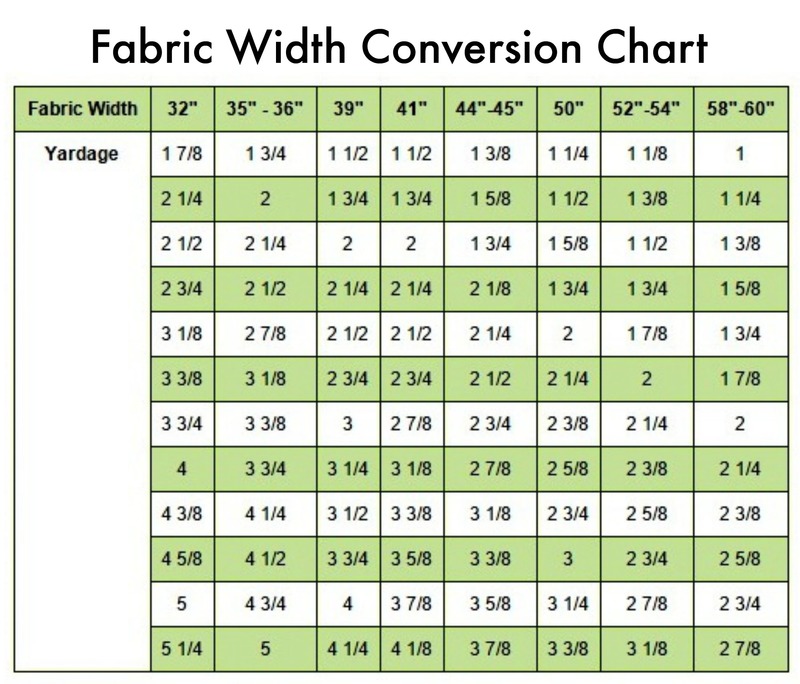 I love the fabric conversion chart, I know that will help me out. I am still skeptical about buying fabric online. I have some knit that is thinner then what was described so now it’s just waiting to be made into something. Tanya, Thank you for the advice and tips. This is a great post for beginners and those of us who are long-time beginners. AdaH’s advice in the comments is also helpful. Another good guideline to use when buying fabric is from “Fantastic Fit for Every Body” by Gail Grigg Hazen. The thicker the crisper, the heavier the fabric, the closer to the body the garment should be and there should be more opportunities for fit. The thinner, the softer, the drapier the fabric,the more volume the garment must have. I have found this advise invaluable over the years. This is such a fantastic post, Tanya! It’s exactly the sort of write-up I wish had been around, when I’d started sewing all those eons ago. This is going to be really helpful to our beginners out there! 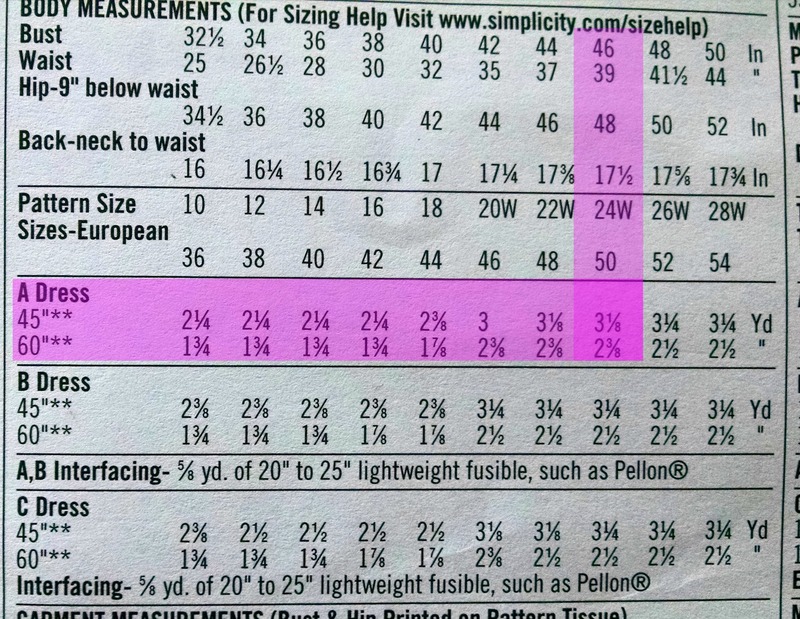 I’ve been sewing for over 20 years and I can’t believe this is the first time I have heard of a fabric width conversion chart. I’ve got one now and it will save me so much time. Thanks a million!